Dr. Ellis completed her undergraduate education at Youngstown State University and received her medical degree from University of Osteopathic Medicine and Health Sciences. She completed her Ob/Gyn training at Akron City Hospital. She is board certified and a member of the American Collete of Obstetrics and Gynecology. Dr. Ellis has been practicing in the Akron area since 1993. She has been honored as a three time recipient of Summa Hospitals Superior Patient Care Award and was featured in NorthernOhio Live, September 2002 issue, as one of the area's top physicians as selected by her peers. 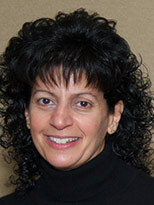 She is a member of the teaching faculty at both Akron City Hospital and Akron General Medical Center. Dr. Ellis is married to Mike Santucci, an Engineer. She has four children. In her spare time, she enjoys spending time with her family, playing the piano, running and reading.